In my last two posts, we looked at the history of the English Bible up to the King James Version. The King James Version was an excellent translation at the time it was completed. The translators used the best manuscripts and the best methods current in their time. The KJV is well-known and well-loved. It should be well-respected and appreciated. However, two important factors helped drive the continuing work of translating the Bible into English. One is that the KJV is based on manuscripts that are not as close to the original manuscripts’ ages or contents as manuscripts discovered more recently. Second, the KJV’s translation contains phraseology and vocabulary that is no longer in common use today. Languages change over time, so that words no longer have meanings they once had or acquire new meanings or simply fall out of use and become archaic. New readers of the Bible inevitably have difficulty deciphering the lingo of four-hundred years ago. Therefore, translators of the Bible continued to work to produce readable and reliable versions of the English Bible. The King James served as the beginning point for a number of more recent translations. The English Revised Version of 1885 was the first modern English translation to make use of modern principles of textual criticism. In 1901, the American Standard Version was produced as a revision of the ERV. The Revised Standard Version (RSV) was produced in the mid-twentieth century. The RSV translators used the best of modern scholarship, while also using language that would be appropriate for public and private worship. And then we have the New King James Version, which updates the language of the KJV. That’s just a handful of the English Bibles since the KJV. Below is a longer list of those that are significant, but it is also quite short. A complete list of English Bibles (including full Bibles and portions) has over 200 entries. Between Wycliffe and our next influential figure, several key historical developments took place. One was Gutenberg’s invention of the moveable type printing press in about 1450. This is considered the most important invention of the modern era, and it fueled the proliferation of literature that led to the Reformation and the Renaissance. A second development was a renewed interest in the biblical languages. Scholars began going behind the Latin to the underlying Greek and Hebrew. Erasmus produced his eclectic Greek New Testament in 1516. Now scholars could use Greek as the base for translating the NT into other languages. So instead of the English NT being a translation of Latin which was a translation of Greek, a much-preferred direct translation from Greek to English was possible. The third important development during this time was the igniting of the Protestant Reformation by Martin Luther and others. Luther produced a NT translated into German from Greek in 1522. The most influential person in the history of the translation of the Bible into English was William Tyndale (1494-1536). Tyndale produced the first complete translation of the New Testament from Greek into English in 1526. He was able to translate much of the OT into English from Hebrew before he died, his body burned at the stake for translating the Bible. 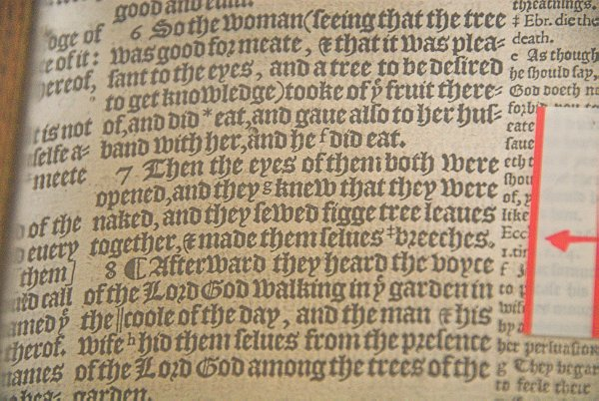 His was the first English Bible to be printed on the printing press. Tyndale’s passion was that people who spoke English could have the Bible in their own language. Prior to his execution, Tyndale offered this prayer, “Lord, open the King of England’s eyes.” Two years later, the King of England authorized a translation into English, the Great Bible, which was done by Tyndale’s disciple, Miles Coverdale. This was the first English translation authorized to be read in the Church of England. To give you an idea of Tyndale’s influence, some estimate that around 80% of the King James Version uses Tyndale’s wording. Another translator, who, like Miles Coverdale, was a disciple of Tyndale, was John Rogers (1500-1555). Rogers actually worked under the pseudonym “Thomas Matthew.” He produced the second full Bible in English, but his was the first to be based completely on Greek and Hebrew. Known as the Matthew-Tyndale Bible, it was published in 1537. In 1539, The Great Bible, was published. Thomas Cranmer, the Archbishop of Canterbury, hired Miles Coverdale to produce a new English translation of the Bible to be used in the newly formed Church of England. The Great Bible was available to the public but chained to keep it in its place. Now, the Anglican leadership did not particularly care for the Geneva Bible, because of its inflammatory notes (like calling the Pope the Anti-Christ). So they produced the Bishop’s Bible in 1568, which was basically a revision of the Great Bible. It did not become popular. The Catholic Church sought to regain some ground with the English, so they produced a Catholic version of the Bible in English known as the Douay-Rheims version in 1589. Named for the cities in which the OT and NT translations were produced, this Bible was translated from the Latin Vulgate, which Erasmus had shown was based on corrupted Greek and Hebrew manuscripts. In the year 1604, King James I authorized a translation project that produced a new Bible in 1611. The king commissioned it in order to satisfy factions within the English Church. It would be a translation in the common language, yet still dignified for worship. In England, it is known as the Authorized Version. In America, we call it the King James Version. The Authorized Version underwent significant revisions in 1629, 1638, 1729, and 1762. The 1769 revision is the one predominantly in use today. I hope this survey of English Bible history answers some of your questions about how we got the Bible. There is much more to the history of the Bible than this. Every time I consider the brave souls who labored to translate the Scriptures into my language, I am humbled and grateful for their sacrifice. I hope you are too. May we never think too lightly of the sacrifices made to get us God’s Word. In a future post, I hope to continue with a little more history of English versions of the Bible after the King James Version, and we will compare some newer translations of the Bible to help you know how to choose which one is right for you.